WOW! These pots of gold are full and overflowing! 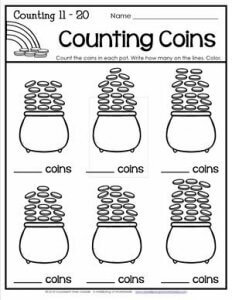 In this St Patrick’s Day worksheet kids count the number of gold coins in each pot and write how many on the lines. Each pot has between 11 and 20 coins arranged in a somewhat ordered manner.